WinRAR is a powerful archiver and archive manager. RAR files can usually compress up to 15 percent better than traditional ZIP-files. WinRAR''s main features include strong compression, ability to process non-RAR archive formats, embedded file comments, encryption, ZIP compression and decompression, support for long filenames, Recovery of physically damaged archives, Multivolume archives, unicode support in archive filenames and support for self-extracting archives (SFX). 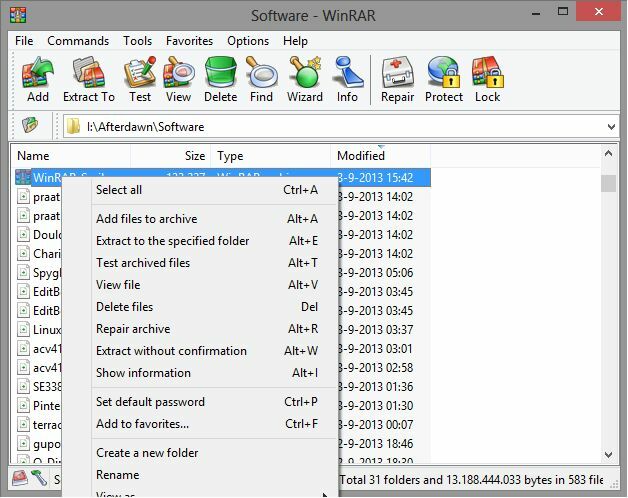 Additionally to complete support of RAR and ZIP WinRAR provides basic operations for 7Z, ACE, ARJ, BZ2, CAB, GZ, ISO, JAR, LZH, TAR, UUE, Z files created by other tools. Ive been using this program for years. Unlike WinZip You only have to pay for it once. Hence free updates!.